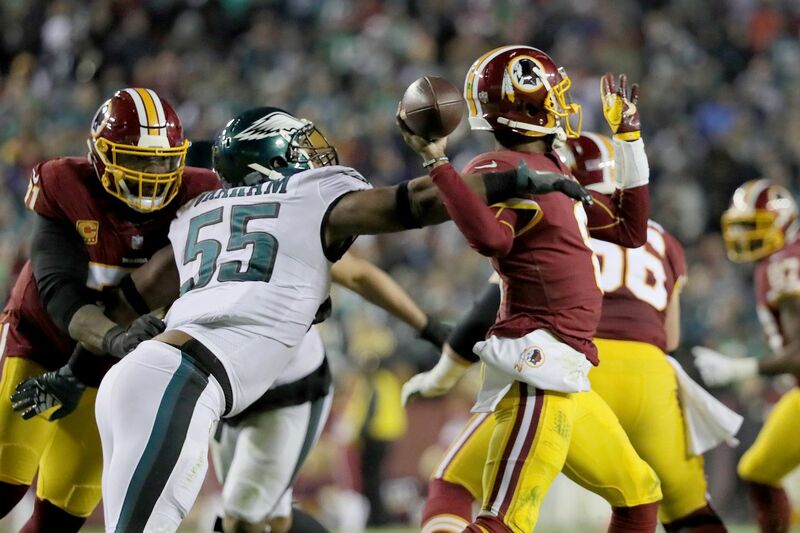 Eagles defensive end Brandon Graham, left, tries to strip the ball from Washington quarterback Josh Johnson, right, in the 2nd quarter as the Philadelphia Eagles play the Washington Redskins at FedExField in Landover, MD on December 30, 2018. Among the laundry list of things the Eagles need to do better Sunday against the Saints than they did on their forgettable visit to New Orleans eight weeks ago, is get pressure on quarterback Drew Brees. This, of course, is much easier said than done, because the future Hall of Famer who turns 40 next week is not an easy guy to put on the ground or hit. It’s not that he has exceptional escapability. It’s that he has a knack for frustrating pass rushers by getting the ball out before they arrive. Kind of like a smart criminal who gets rid of the evidence just before the police arrive. That was evident in the first meeting Nov. 18. The Eagles had no sacks and only one hit on Brees as he threw for 363 yards and four touchdowns against an injury-ravaged secondary that was a hamstring strain away from needing to ask for volunteers from the crowd. Defensive coordinator Jim Schwartz blitzed on a season-high 34.4 percent of the Saints’ pass plays (11 of 32), and had nearly every one of those 11 blitzes blow up in his face. Brees completed nine of 11 passes for 155 yards and one touchdown when Schwartz sent extra rushers. But a couple of things have changed since then. For one, the Eagles’ secondary is in much better shape than it was in Week 11 when Schwartz had to throw De’Vante Bausby (since released) and Chandon Sullivan (currently on the practice squad) out there at cornerback for a combined 50 snaps. For another, the Eagles’ front four has been playing really well lately and thinks it has learned a lot from that Week 11 experience, when they had a season-low 10 quarterback pressures (sacks, hits and hurries). “We’re going to show that wasn’t us [last time],’’ defensive end Brandon Graham vowed. “It’s not going to be like that this time. I’m sure by the way we’ve prepared that we’re not going to put that out there again. New Orleans Saints quarterback Drew Brees runs with the football with running backs Mark Ingram (left) and Alvin Kamara against the Eagles on Sunday, November 18, 2018 in New Orleans. If the Eagles’ secondary can’t occasionally take away Brees’ first read Sunday, though, it’s going to be awfully difficult for Graham and the rest of the defensive line to get to Brees, who has the lowest sack percentage of any active quarterback, and the fifth-lowest in league history. He’s been sacked just 17 times this season. The Saints have allowed no more than one sack in 10 of their 16 games. They’ve given up more than two just once (three vs. the Browns in Week 3). While the Saints have a pretty good offensive line, a substantial chunk of the credit for that low sack total goes to Brees. “We’ve got to make sure we at least take away that first read,’’ Graham said. “Because [if] you take away that first read, now he’s got to [go through his progressions]. Schwartz, who likes to blitz only slightly more than he likes to listen to Barry Manilow, has pretty much gone back to relying on the “engine’’ of his defense, the defensive line, to pressure quarterbacks. The Eagles blitzed just three times in last week’s wild-card win over the Bears and have blitzed on just 29 of 296 pass plays (9.8 percent) over the last seven games. The front four has registered 20 sacks and 151 total quarterback pressures in the last seven games. Graham is playing his best football of the season. He has 23 of the Eagles’ 74 quarterback pressures in the last three games and split a third-quarter sack with Tim Jernigan last week against the Bears. All-Pro defensive tackle Fletcher Cox had a career-high 10½ sacks and finished second in the league to Aaron Donald in total quarterback pressures (95), according to data by Pro Football Focus. He has 43 pressures in the last seven games. Michael Bennett has 33 pressures in the last seven games, including 4½ sacks. Chris Long has 23 pressures and three sacks since the first Saints game. But Brees, who led the league in passing this season, isn’t Mitchell Trubisky or Deshaun Watson or Dak Prescott. He’s not going to get caught flat-footed by the Eagles’ rush. “You just have to stay with the game plan and not try to create something new,’’ Bennett said. “We have to be who we are as rushers and be who are as a defense. Drew’s like any other quarterback. You just need to get to him and affect him.